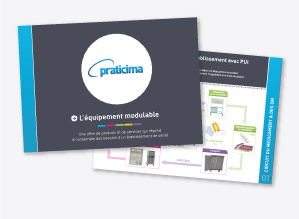 To answer our customers requirements, PRATICIMA is composed of a sales service about 40 persons for the French market. Our 1st aim is to provide you specific and adapted solutions. The sales service is composed of two branches: Hospital facilities and Medical social establishments. A team is dedicated to answer to the requirements and the complexity of care establisments. This sales force is made of specialists in flow management, tracking, computerization and in the patient transfer aid or the logistic cupboards transfer. Another team is dedicated to medical-social establisments. A distributor network attended by our sales forces permit a territorial grid and a proximity with those institutions. Our historical position in the medicine circuit allowed us to support the evolutions and almost regarding the Dosing Preparation and Administration; for which we can help you to find the best solution in medicine tracking and securisation. We are at your disposal for every information you may need.